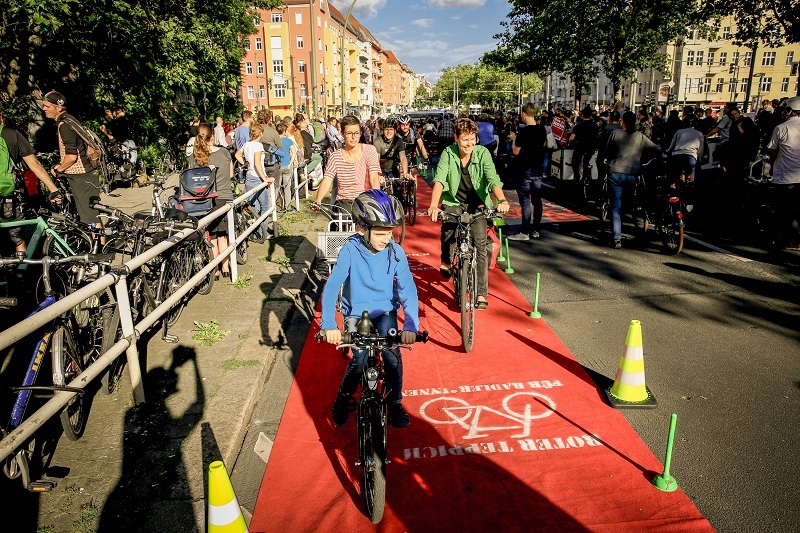 On June 28th 2018 Berlin’s Parliament signed a new Mobility Act into effect. 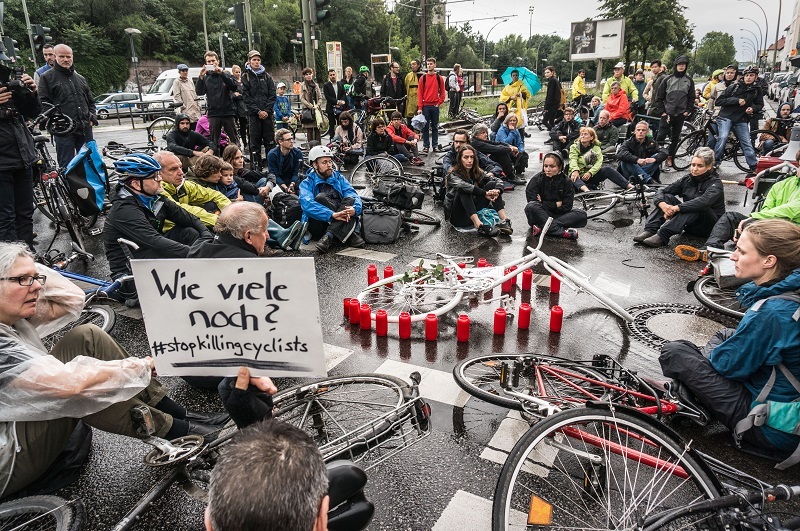 This was the final point of a more than two and a half-year long campaign by the Initiative Citizens Referendum for Cycling in Berlin and their umbrella organization Changing Cities. even working independently of the German Bicycle Club, ADFC. In brief: the time was ripe for change! 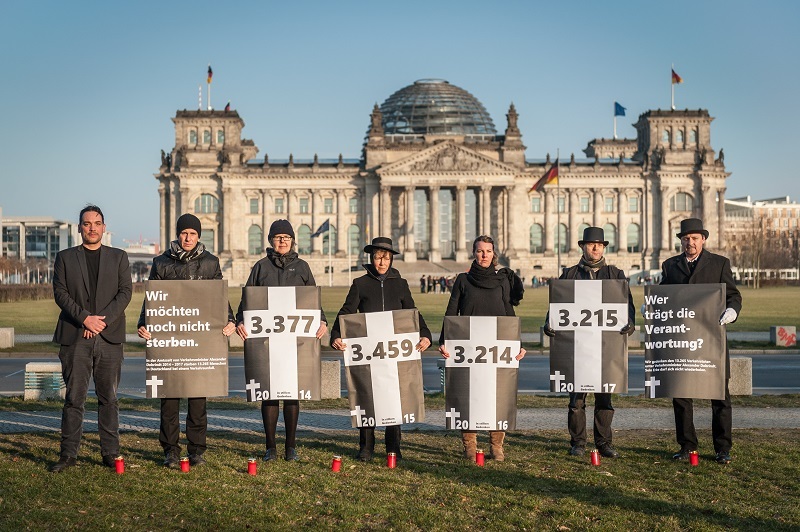 The next step was to determine ten goals, and to use them to begin an unprecedented campaign which, in a short space of time, wrote a new law, then collected over 100,000 signatures within the three weeks leading up to the elections for Berlin’s City Parliament. 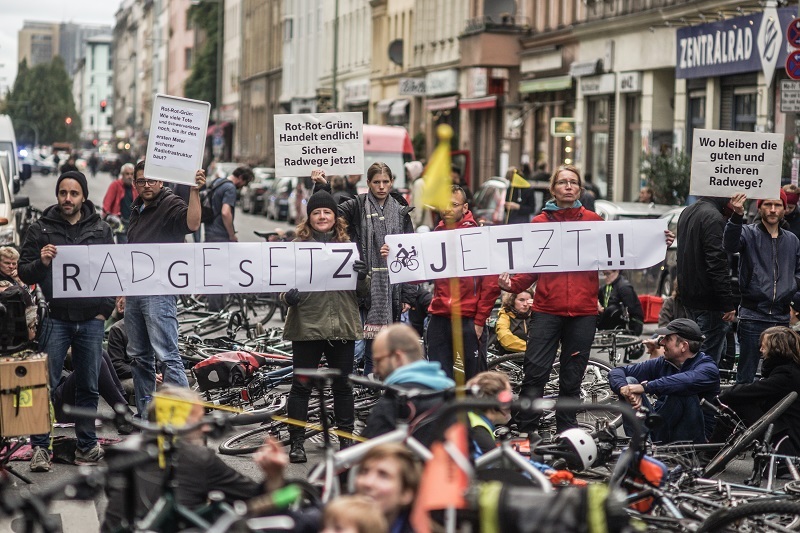 The result was the near-complete adoption of the demands of the Citizens’ Cycling Referendum in the coalition agreement, combined with the possibility that not only a Cycling Act, but also an entirely new Mobility Act would be passed, with the goal of steering Berlin away from auto-centric city planning. 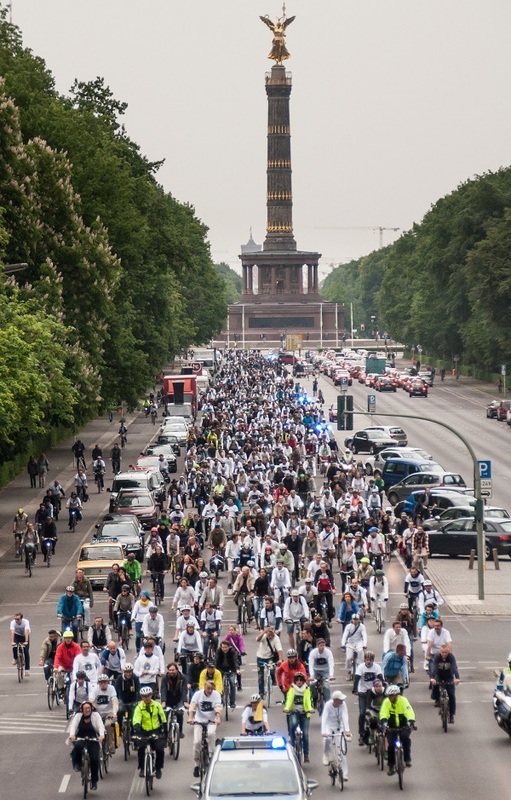 The Berlin Cycling Referendum started by creating a Cycling Act and ended up with a sustainable transportation law for all of Berlin! Negotiations about what the Mobility Act would consist of began in early 2017. 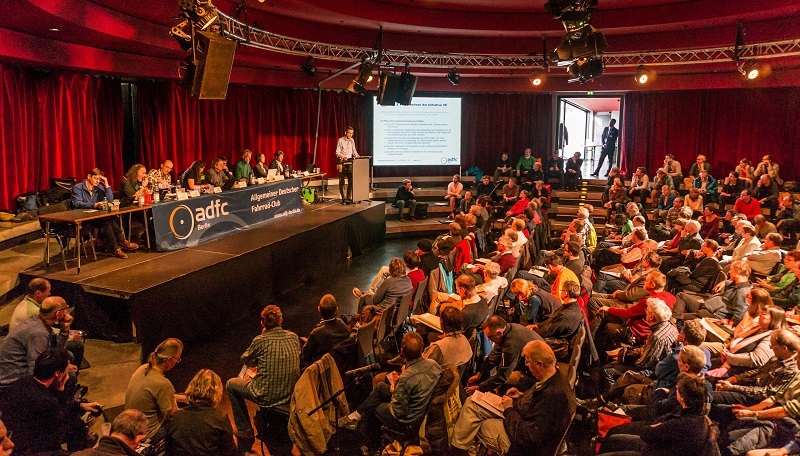 Once more, in an unprecedented occurrence, representatives from the Senate, the City Parliament, and civil society, represented here by the Cycling Referendum, ADFC (German Bicycle Club), and BUND (Friends of the Earth Germany) worked harmoniously together to create a draft of the law. 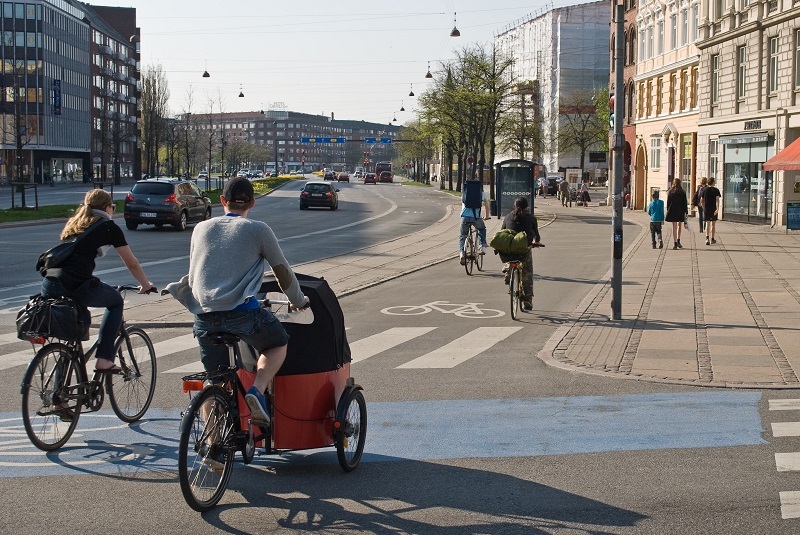 every citizen to be able to ride a bike in a safe and stress-free way. At the same time good infrastructure will fight air pollution, work to slow climate change, and the entire city will benefit from more people being encouraged to ride bikes. The Mobility Act (MobG) is divided into several sections. As it stands it has a general background section, a section dealing specifically with public transport, and one dealing with cycling. In the general section, overarching goals and guidelines are presented, including priority for sustainable transportation. The Act also provides guidelines for which decision making criteria should take precedence when differing transportation interests are in conflict, for example preference being being given to moving rather than stationary transport. 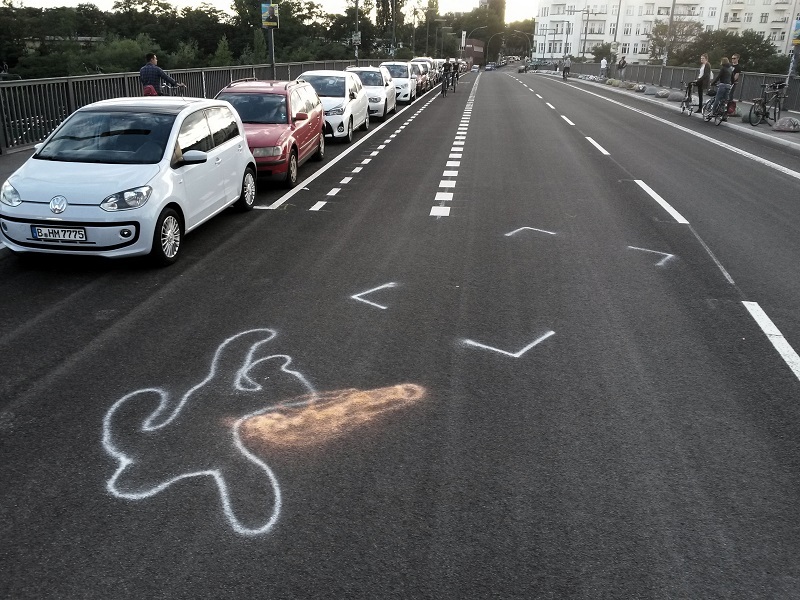 The guiding principle of all these initiatives is the concept of “Vision Zero,” in other words, the fundamental goal of organizing transport to avoid serious injuries or deaths. Even though transport safety was not explicitly considered in the original deliberations, it became central to the initiative. which seek to raise consciousness about the fact that people who are injured or killed in crashes are not simply statistics but human beings with relatives and friends for whom these crashes change their lives forever. Most of the main goals of the Cycling Referendum can be found in the section on cycle transport. A dense network of cycle infrastructure will be created for the entire city, consisting of cycle paths of adequate width on all main roads, which will be protected from being parked on or driven on by motor vehicles, as well as a network of side streets appropriate for cycling through the city. 100,000 new parking spaces for bikes will be created by 2025, construction sites will be required to be made safe for cycle traffic, and a system will be set up to monitor progress of these various aspects. 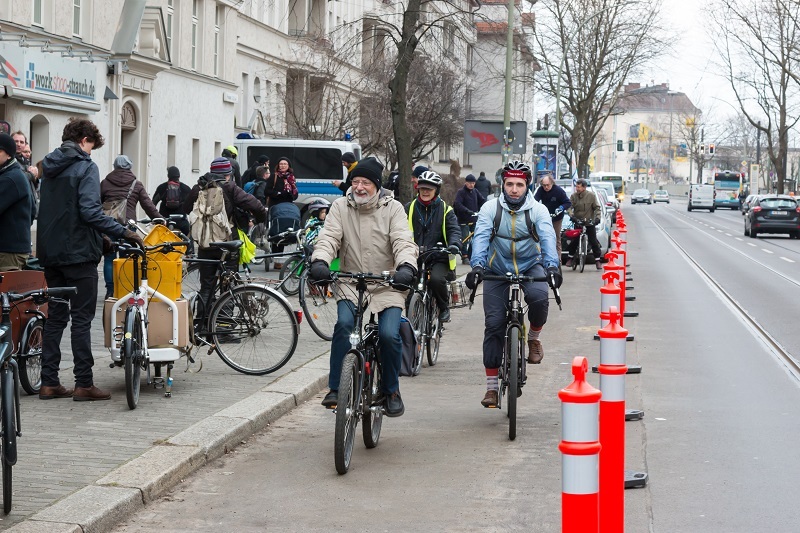 Even before the law was ratified, funding for 50 to 60 new cycle traffic planners had been allocated and approximately 50 million Euro set aside for cycle traffic in Berlin. The law itself will continue to be expanded: at the moment a broad participation process is being undertaken in order to create a section for pedestrian traffic. Furthermore, within a year, a section on intelligent mobility, whatever that means, will be added. 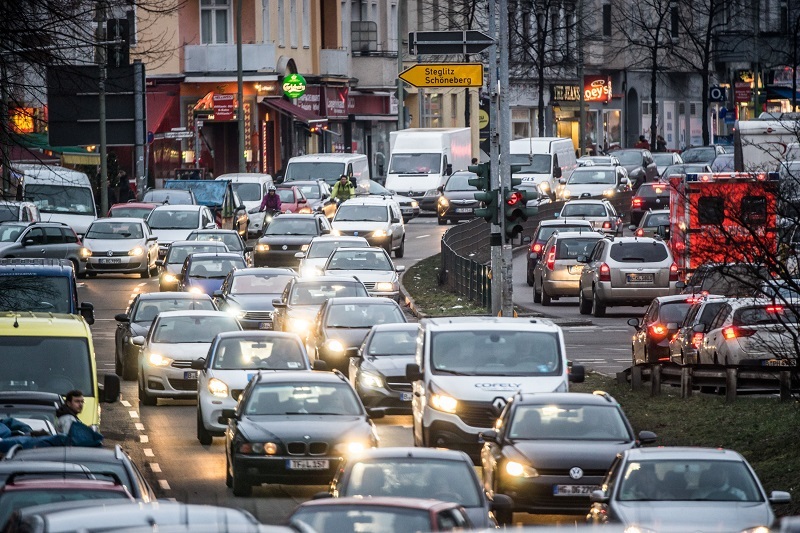 The Mobility Act represents a success for Berlin’s civil society. The Act’s origins and contents show that transportation politics has far too long been carried out as politics of “No Alternative” , that is, in favour of the status quo and to the exclusive benefit of the private automobile. For decades, cities have claimed that they want to promote cycling, yet no city has dared to rethink the use of public space. 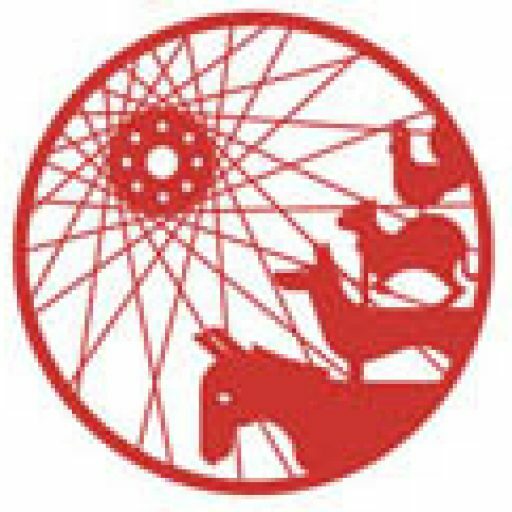 The Cycling Referendum makes the claim that transportation politics does not only need to represent those who already cycle for transportation, but especially for those who would like to ride a bike but do not feel comfortable doing so. 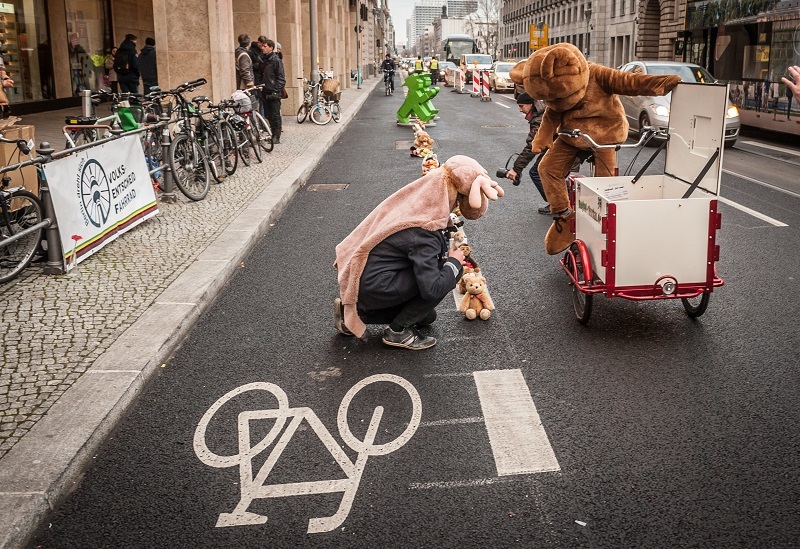 Action “Bärchen gegen Brummis” (Teddies against Cars) Volksentscheid Fahrrad, Berlin, 7.12.2016. But it’s taking far too long! Despite the ratification of the Mobility Act this work is far from being finished. Eleven and a half years remain before the cycling infrastructure network included in the law will actually come into existence. 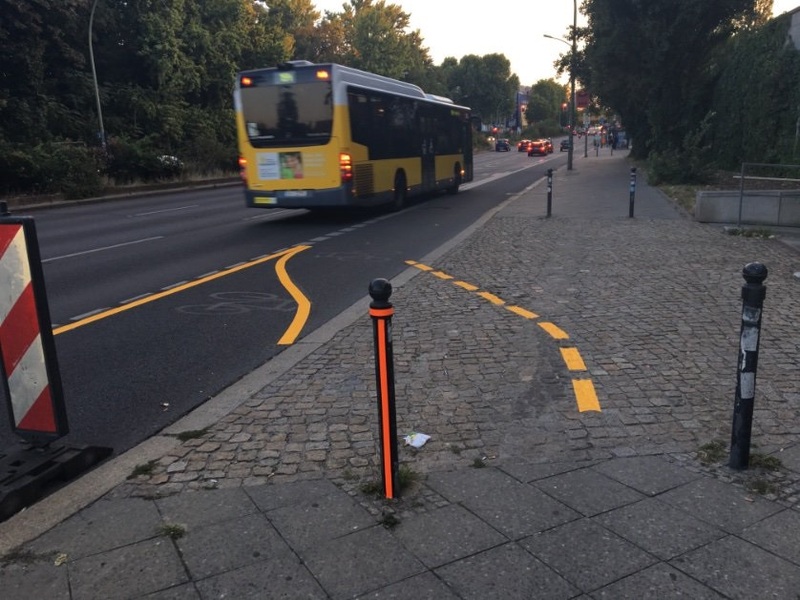 At the same time, building a cycle path in Berlin takes, on average, four years, with the actual construction itself, at the end of this long process, only taking a matter of weeks. Within Berlin’s administrative structures, the way processes are carried out are still very unclear and it is not clear who is responsible for which aspects. The result is that no one person or office is actually responsible, a situation that does not contribute to these processes being carried out in a timely fashion. In some neighborhoods, there is even still resistance to the law itself, in addition to those elements within administrative circles who are still fighting to keep every single car parking spot. In order to continue to actively work for the implementation of the Act, to put pressure on the government in creative ways, and to assist and advise Berlin’s politicians, the initiative and its creators will continue to be active. 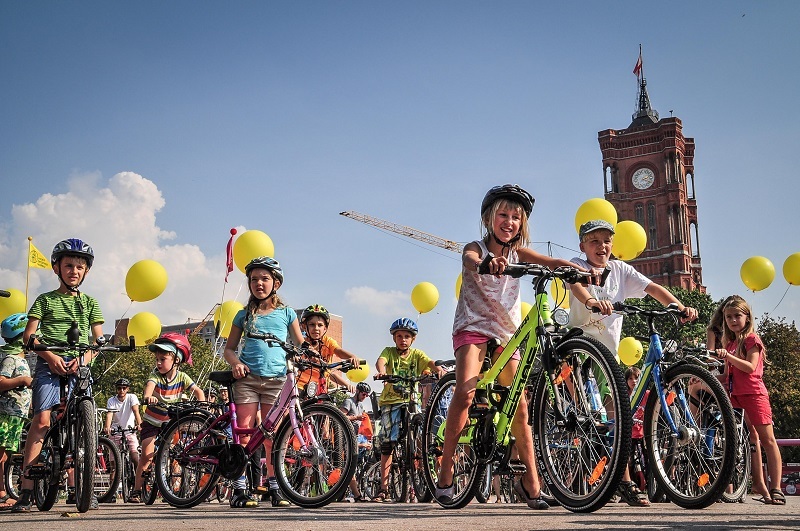 They will receive additional support through the Network for Bike-Friendly Cities, which now exists in many different neighborhoods. 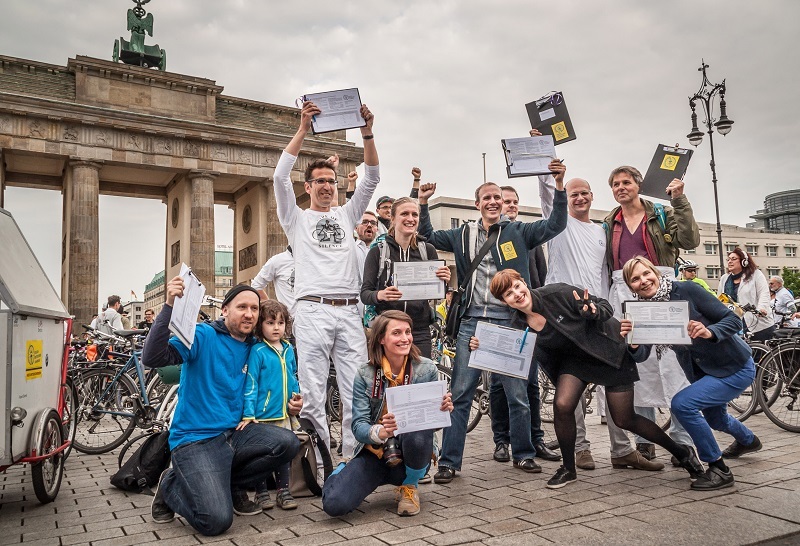 These groups bring together Berlin’s most valuable and most intelligent resource: Citizens who are volunteering their free time to make their city more liveable. But this is only the beginning: inspired by Berlin’s success, similar initiatives were started in Bamberg, as well as Darmstadt, Frankfurt, Kassel, Stuttgart, Hamburg, and many other cities (please forgive the author if he has forgotten any!) 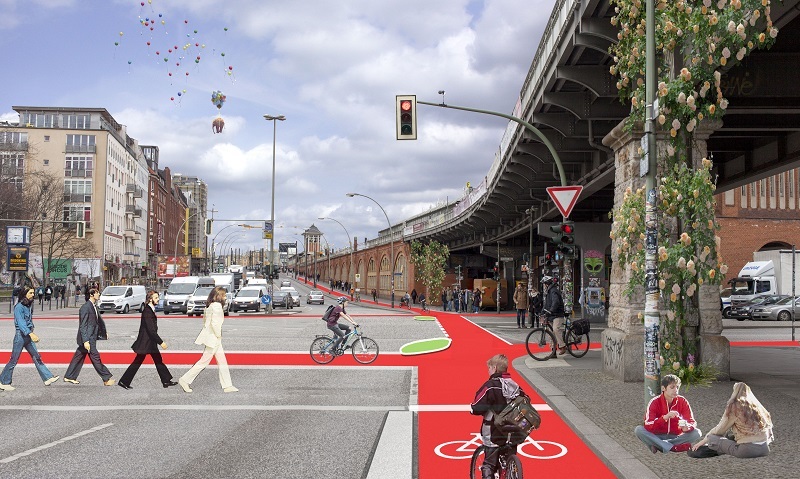 as well as a state-level Cycling Referendum in North-Rhine-Westphalia. All these grassroots movements are united by the idea that transportation politics can and must be transformed from below, and in fact that this is the only way for it to be democratically organized. 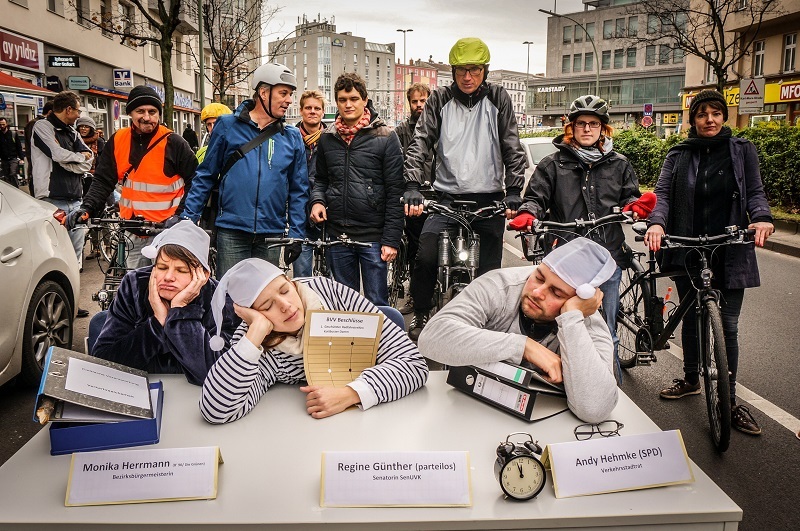 Above all, it is civil society who is for putting cycling on the political agenda. The more initiatives there are, the easier it will be for new ones to get started. Activists have already created a kind of campaigning toolkit with differing demands that can be adjusted to the size of the city, as well as arguments to promote cycling and different forms of actions and demonstrations which Berlin activists have developed- These were created in the spirit of open-source software so that they can be used, developed further, changed, and improved to suit the needs of organizers in other cities and towns. In more and more cities, ordinary people are daring to demand transportation change and more fairness in access to public space. The bike is, here, the key to change. Not only because it is ideal for the average urban outing and the kinds of daily errands and trips city-dwellers make, but also because the bike in and of itself gives a sense of self and identify reaching far beyond technology-loving subcultures. With every city that starts its own a Cycling Referendum, the movement for cities for people grows. Changing cities stands for this movement and for a network of campaigns that wants to push transportation change upwards from below, from the grassroots level. Epilogue from Bremenize: With our experts we are now also part of the cycling network in Germany.